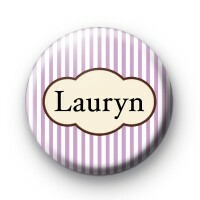 A lilac & white striped name badge for a hen party which can be customised with any name or text you like. Simply enter the text required in the box below & click add to cart. Do this as many times as you like to create a whole set of name badges for your party, wedding or event. Standard 25mm button badges hand made in our UK workshop using metal badge components and a copper pin back. We have hundreds of Hen Party Badges to choose from on the website & most of them can be customised and personlised with your own names & dates. If you have a Hen Party coming up or are planning for a wedding be sure to checkout our hand made hen party badges & wedding badges. From classy hen badges to customised name badges and hen do badges, we have a huge choice of badges to choose from. They are perfect for your Hen Party and can be used on your wedding day as part of the celebrations. If you don't see the designs you are looking for, get in touch with your requirements and we may be able to design what you need. Also be sure to checkout our Wedding Badges for your big day.